Commonly referred to as woodfuel heating systems, biomass heating systems are usually fuelled by plant materials, such as logs, woodchips, or energy crops. Heating with biomass is deemed to be carbon neutral, as the carbon dioxide (CO2) released when burning biomass is equal to the CO2 absorbed in the original growth of the biomass during photosynthesis. Biomass is any organic matter that has stored energy throughout its life via the process of photosynthesis. In the UK and Scotland a biomass boiler burns logs, pellets or wood chips, and is usually connected to a central heating and/or hot water system in much the same way as a standard gas or oil boiler would. It is a great renewable energy solution for the direct replacement of ageing oil or LPG central heating systems in areas not serviced by the mains gas grid, or to replace older steam or process equipment. 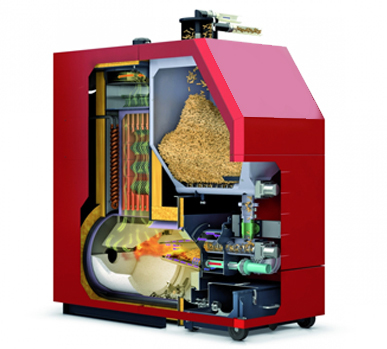 Selected Eco Energy can supply and install biomass boilers in a range of sizes and variants. From small domestic systems from (40Kw), all the way to (15Mw) commercial heating systems. We have vast experience in this sector and the ability to design and install systems that perfectly match your requirements and fully comply with Renewable Heat Incentive (RHI) design standards. We only use high-quality boilers from established manufacturers ensuring the system you invest in is built to last.